Cleansing brushes are popular and as a result near enough every major skincare brand now offer their very own cleansing brush. And it's not surprising as with regular use they can clear congested skin and bring dull, dry complexions to life. But up until now there have been two technologies on the market: vibrating and rotating. But the Clarisonic Smart Profile is a unique cleansing brush with sonic-vibration technology, which is more powerful than any other device on the market, removing up to 11x more makeup than hands alone, offering a professional cleanse at the push of a button. This unique cleansing brush is a versatile head-to-toe cleansing tool for the face, body and even your feet with pedi buffing brush heads available to purchase - something I will be investing in shortly! The waterproof brush is slightly bigger, but sleeker in design in comparison to other cleansing tools, yet is comfortable to hold. The brush also includes two SMART brush heads; the SMART Profile Dynamic Facial Replacement Brush Head (for all skin types) and the SMART Turbo Massage Body Brush Head. Both brush heads are surprisingly soft considering how dense they are, which is fab as firm brushes can be too harsh and often leave my skin red and a little sensitive. And the added body brush is great; as it works well as tackling ingrowing hairs and keratosis pilaris two things I admittedly suffer from. But get this; the brush heads have been embedded with a chip that indicates when it's time to change to a new brush head! Not only are the brush heads SMART, the functionality is also. Firstly, there is a 60-second, four-stage intensity cleansing cycle and as each cycle ends, there's a beep to prompt you, with the changing intensity to move to a difference area of the face (forehead, nose, chin and cheeks). I personally love the timer, as I have the tendency to get carried away and generally overuse of cleansing brushes can lead to irritation, redness and sensitivity as mentioned before. There is also a turbo button, a feature not available on their other models, which allows you to shift into a higher strength cleansing speed at anytime, so you can add a little oopmh to more congested areas of your face and body. It's charging cord can be plugged into the provided adapter and your laptops USB port and the charger is magnetic - another feature only available on the SMART Profile. Battery life, is pretty good, lasting for up to 128 minutes and I'm still yet to charge mine after two solid weeks of use. Two deluxe samples of their Refreshing Gel and Refining Skin Polish are included and they both smell lovely and work well, although I prefer to use my regular skincare products. It goes without saying that the Clarisonic SMART Profile is a vast improvement on their previous models. It's uh-mazing. I eased the brush into my routine and now use it once every other evening. But after the first use, I saw an improvement instantaneously - yes really. In fact, I couldn't get over the difference between my previous cleansing device and the SMART Profile, as I had presumed although it comes with all the bells and whistles it would have given similar, if not the same results. But I was so wrong. I love how my skin looks and feels after each use, my scars are fading and my skin looks far healthier. One of my biggest skincare concerns is blocked hair follicles on the sides of my face, which have always caused me trouble. But I have seen a huge improvement in my skin texture and cannot wait to see the difference it will make with continued use over the next couple of months. And I have since passed on my previous cleansing brush to my Mum (with new brush heads of course)! The one drawback is the price. Costing £199, the Clarisonic SMART Profile is a skincare investment. If your hesitant, I completely understand. But unlike other beauty tools, it won't be money wasted. 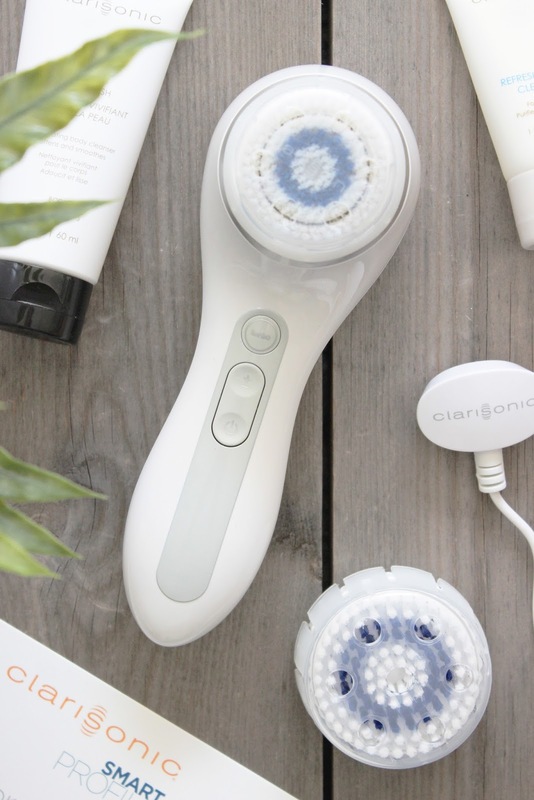 I whole-heartedly recommend the Clarisonic SMART Profile and it is available online at Debenhams here where you can collect beauty points and currently receive 10% off. Have you ever tried a sonic cleansing device?